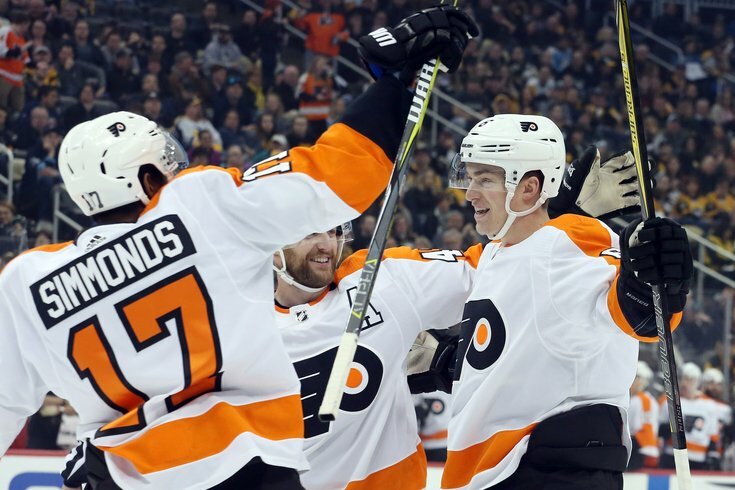 Philadelphia Flyers defenseman Travis Sanheim (right) celebrates with right wing Wayne Simmonds and defenseman Andrew MacDonald after scoring a goal against the Pittsburgh Penguins. With six games left, it’s looking very good that the Flyers will make the playoffs. And although it may seem slightly outlandish to say this about a team that remains the most enigmatic in the NHL, no one wants to face the Flyers in the postseason, simply because they don't know what they'll be facing. Will it be the team that went 0-5-5 during that dreadful stretch earlier this season, or the one that more recently went 10-0-2 over a 12-game span? It may be maddening for fans to see that level of inconsistency, but it's also what makes the Orange and Black the most unpredictable team heading into April. If the playoffs were to begin today, Tampa Bay, Boston and Toronto would represent the NHL’s Atlantic Division, while Washington, two-time defending Stanley Cup champion Pittsburgh and Columbus hold the top three spots in the Metropolitan Division. The Flyers hold the No. 1 wild card position and New Jersey has the second. The Flyers missed the postseason last year, and this would mark just the third time in the last six years that they'd be playing into the spring — if everything holds up. But the team hasn’t won a round in the playoffs since it beat Pittsburgh in six games back in 2012. Against the seven teams that currently hold playoff positions in the Eastern Conference, the Flyers are a combined 11-8-5 (Tampa Bay 1-1-1, Boston 0-2, Toronto 3-0, Washington 3-1, Pittsburgh 0-2-2, Columbus 2-1-1 and New Jersey 2-1-1). What it means is no mystery: The Flyers can play with any team in the Eastern Conference, and with the return of a healthy Brian Elliott, who’s been out since Feb. 13 after undergoing core-muscle surgery, they could bear watching. The Flyers have six games left to try to improve their place in the standings. They start Tuesday with an arduous back-to-back on the road in Dallas and Colorado, before returning home to face Boston on Sunday. From there, they play at the New York Islanders next Tuesday, followed by home games against Carolina (April 5) and the New York Rangers (April 7). The Flyers, staying true to their enigmatic ways right to the end, enter this last stretch of their season 3-0-2 over their last five, after coming off a stint in which they were 1-5-0. But one thing is certain: Coach Dave Hakstol's tolerance level is low. Hakstol benched Travis Konecny for most of the third period in the Flyers’ 4-3 win over the Rangers on March 22, after yanking Petr Mrazek against Detroit in the middle of the second period during a 5-4 shootout loss to Detroit on March 20. In Sunday’s 5-4 overtime loss to Pittsburgh, Hakstol pulled Alex Lyon early in the second period after he gave up three goals on 11 shots. Hopefully, Michal Neuvirth, who has been gone since Feb. 18 with an injury, will make a return this week, something Hakstol has not ruled out. And Elliott could be back for the final week of the regular season. That's becoming more and more important by the day. After a hot start for Mrazek, the Flyers' trade deadline acquisition from Detroit hasn’t been the answer. He’s 1-2-2 over the Flyers’ last five games and 2-5-3 over their last 10. As for the positives, Claude Giroux continues to enjoy what could arguably be his best season yet. He recorded his 65th assist in the Pittsburgh loss, which ties a career high and moves him into a tie for the league lead with Winnipeg’s Blake Wheeler. Giroux is also two points away from tying his career high of 93. Both his previous career-bests in assists and points came during the 2011-12 season. Against Pittsburgh, the Flyers set a season-high in shots on goal with 45. They tied a season-high with 32 shots through the first two periods, also done on Nov. 21 against Vancouver. Goals by Travis Sanheim and Brandon Manning gave the Flyers 46 goals from defensemen this season, which is tied for second-most in the NHL and is the most the Flyers have gotten from their blue line since the 1992-93 season, when defensemen scored 52 goals. The Flyers could be a scary team for anyone in the Eastern Conference to face next month. Or they could be out before you can blink. Both are real possibilities – it’s just a matter of which version of the Flyers shows up.